"After carefully selecting unique, superior quality fabrics, we re-orientate, redesign and interpret these colorful materials in a radically different way to create well-crafted, authentic custom-made durable handbags and other fashion products. This portfolio of products accentuates the appeal of our sophisticated customers, empowering them for the world to admire." Fricaine offers the finest quality handbags at affordable prices! I have been very impressed with the bag I received for review and you can read my review here. 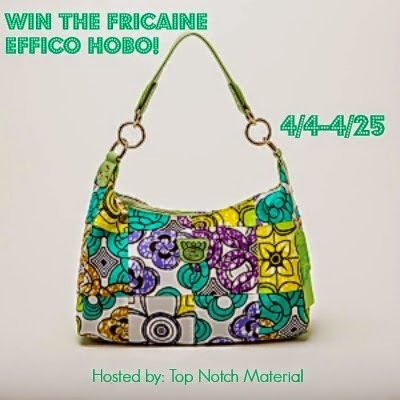 If you are searching for a classy bag, but do not want to spent an entire paycheck, check out Fricaine or just enter to win this amazing Fricaine Effico Hobo! Win It: One lucky winner will receive the Effico Hobo Bag. Sweet Cheeks Adventures is not responsible for prize fulfillment.